Get a Digital Copy of Melissa Cox’s Latest EP for just $9.95! 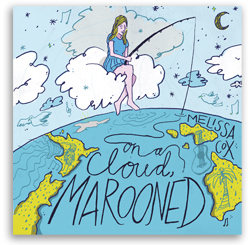 Click Here To Download “On a Cloud, Marooned” Now! From the pure rock angst of “Run For It,” to the indigenous battle cries of “Tall Kanuka,” to the deep sense of loss conveyed in “Amber,” and finally to the open-road jubilation of “Rekindle,” Melissa taps into the five stages of grief to come out on the other side in this moving, highly-produced album that will pull at your heart strings one minute, and have you smiling with hope the next. You will receive a Digital download of “On a Cloud, Marooned”, in high-quality mp3 format, usable on most devices (iPod, smartphone, computer, etc.). Rates are in US dollar.